Gomez, R.; Haurie, L.; Ramirez-Casas, J. 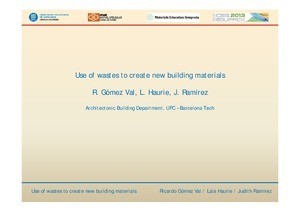 This paper is a teaching activity carried out on the subject of Building Materials from Building Engineering studies. This subject is developed in the second year and lasts for a four month period. The student teacher ratio is around 60:1. The goal of this work was the development of a new building material obtained from waste materials. Students were divided in teams of three students chosen by themselves. This activity helped students to develop knowledge about different materials and make them aware of the importance and possibilities to profit waste materials. Students should work with materials studied in the subject, mainly clay, glass, steel, wood and plastics. Before beginning they must do an important bibliographic research about the topic they wanted to develop. The university provided the use of lab facilities and the guidance of the teacher. Besides following up the work, the teacher encouraged the students to perform some tests on the new material obtained. Finally they should come out with a poster and a sample of the material. Results got from different works differed substantially according to the interest and time dedicated to them. Most of the students abused of the use of polymeric resins to elaborate the new materials, and therefore, even using wastes the new materials were not so sustainable. The use of natural materials such as cane fibres leaded to materials with interesting insulation and structural properties. It was a very good experience to attract students to materials research. Finally we discovered in order to get profitable results, this kind of activity should cover a longer period and should count with the continuous guidance of the teachers. Gomez, R.; Haurie, L.; Ramirez-Casas, J. Use of wastes to create new building materials. A: International Materials Education Symposium. "5th International Materials Education Symposium". Cambridge: 2013, p. 1-13.